added more comment today 11 avril 2013, in green. 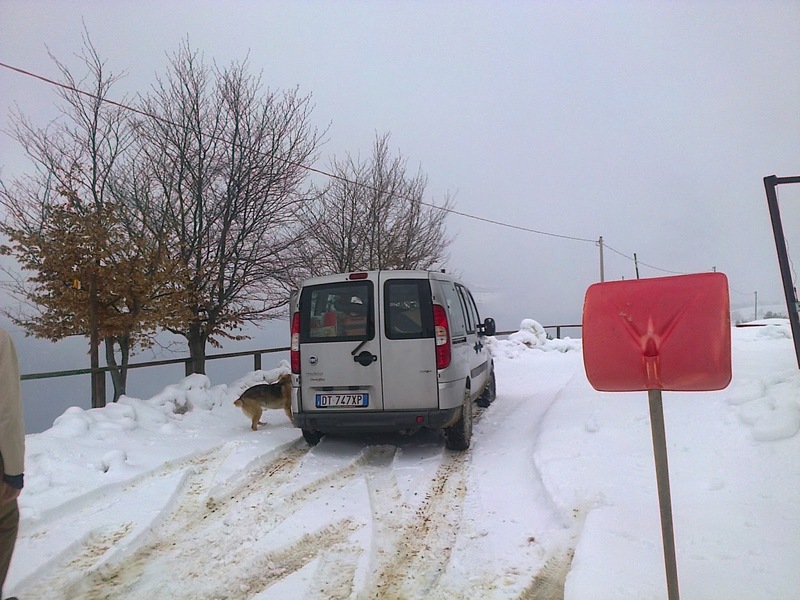 After those 5 days together, there were 10 participants, so we were 11 in a house on top of a hill, Casa Natura Alpenise Cima Grapa. Antonio C (Teatro Invisibile) and Sara C (Anim Arti) organized this retreat, again and again... when I (who is this I, i wonder) decided to stop this Tribuana workshop that I created since 1979..may be the real bud was 1975. Ahh, whenever i said that I who create, i heard "something" in me saying, "hmmm, ignorant Tapa Sudana, I Gede Tapa Sudana, it is not you who start this work, it is already there, inside you, but you ignored it. IT is it, who start everything on earth, in the cosmos. Thank to Peter Brook that asking Regine Guitchula (her assistance in C.I.R.T) to call me in Nice, France in the end of 1978, asking me to participate "the Conference of the Birds". That period Peter Brook looking for mask to tool his "Conference", my Balinese masks and the collection of Jacques Fassola from Nice. We were in preparation to create a show for children with Balinese mask ,music, Barong in our small group PATRA. This Patra dance-theater was created in Geneva in 1974 by I Made Netra and me. I remember clearly, as soon as i arrived in Paris from Nice with my luggage of masks, Peter Brook drove me in his small car direct to rehearsal at Chateau de Vincennes, and the adventure start ......till 1991, passing through creation of Conference of the birds (Europe, New York, Australia), Mahabharata (9 months rehearsal, touring in Europe, New York, Los Angeles, Australia, Japan), Tempeste (Shakespeare, Europe, Japan) and i joined the tour of Carmen (2 group of Carmen performing in Europe and New York). I remember something in me was strick deeply, when actors took the masks, tried them, put on the floor, some of them step over the mask (in my Balinese tradition is not to be done, even touching head of others is not considered as a respectful gesture). Ahh, sorry, here i need to write about the 4 casts/types/categories/division of Balinese society: Brahmana, Ksatria, Wesya, Sudra; it was a division of duty, work, speciality, horizontally, then seems became vertically viewed/interpreted. So, the five days at Cima Grappa give me once again and again to renew my parameter of to be and not to be. and How? Some participants has done the work, past the way tribuana. One of them declare has done 15 times. Antonio C has organized the workshop many time, in Padova, in Caroman-Venezia. Still, hmmm the awakening to realized that Tribuana operates us 24 hours a day. Yes there are moment of pose where night time work on us unconsciously, it is the work for those who explore the never-sleeping consciousness (told by my ancient old Balinese). I wonder, what does he means by that, i am still looking for it in every second of life. 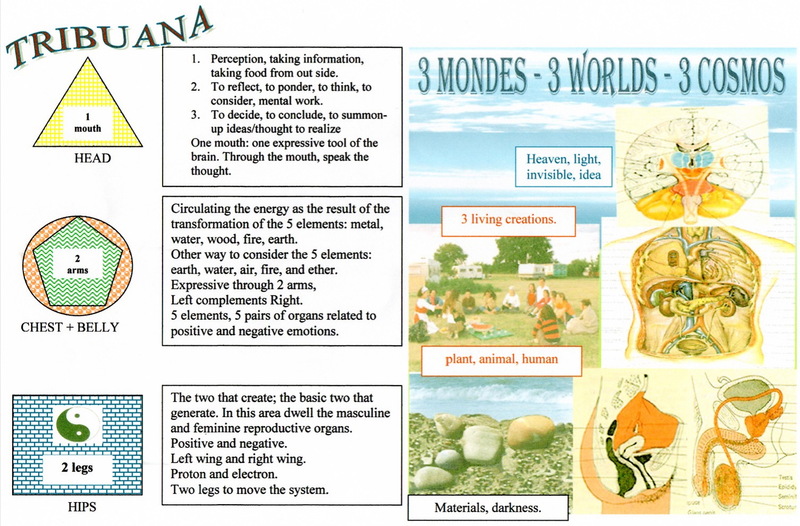 Among 25 "lessons" (fields) to cultivate, as guide, leader, proposer, catalysator (climate/mood creator) I awaken my effort to prepare space and participants to open and invite together the lessons, which one will be explored. We work in the kitchen, dining room, in the space of puppet making, in music space, in meditation & tai-chi-tribuana in the barn with leaning roof limited us to jump and out side in snowy space ?! Tribuana always find work, anywhere 24 hours, just be modest and aware to define "what is the work", where to do, with what? how? Dove il lavoro, e come fare? As usual when we program as what we want, the nature, time, space, participants not always with the program. Pro gramma = in accordance with what you write, first in mind...so, manachika, wachika, kayika : = mind, speach/words, action. Already one lady got head each, 2 days 2 night stayed in bed. Out side there was thick snow, road was covered. Two participants bought with their car woods to make fire, but the fire place in the kitchen produced smokes... even our man-participant is specialist in fire making, he declared he use to make fire in his home. Morning of the last day, first i got one participant that want to make movement, tribuana movement, then one other joint....and when we start another joint. I have three participant on the low ceiling barn. 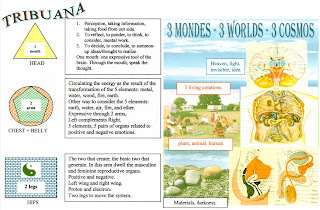 It was a great deep work very delicate, to analyze, to make them feel what was in the movement, which tribuana element was in operation: mind/text-interpretation text suggestion, sound/inner voice produced by the movement (or vice-versa). I was introducing one short movement (gesture) that possible contain an action of "harakiri" ... very simple movement. I realized later that movement came may be i already introduced day & night before the movement of the Phenix. 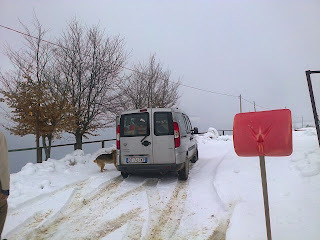 One got it at 04 o'clock in the morning, the other 2 got it out side in the snow the next morning (last day). Have I the right to transmit this movement? hmmm, it was came that moment, my intellectual brain was in pose that moment. Then I proposed each of them to develop, to grow, to cultivate their movement based on the same movement. Then when they ready to find the "sacred syllable" of the movement. Then some more participants came to joint the work. There are some moment in those night & days i loss the sense of time and place where we were. The last night of work run until early morning ... that what often happen in my previous residential workshop of the three worlds ... 20-25 year ago. I remember in Cenci Casa laboratorium in Italia, the last day & night every participant presented their "totem"...so the list of time was filled from morning , afternoon, night, after midnight, down .... no more sleep. 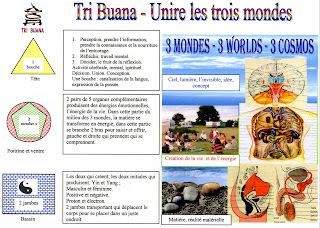 Ahh, i remember one sentence of a character (in Shakespeare's play) i played in Indonesia: "Macbeth sleep no more...."
Tribuana is a new name of "three worlds", les trois mondes, tre mondi ... that was the title of the workshop before 2000 (more less). It is often happen that the "real" work start when the workshop "finish". Once, i did theatrical workshop in Paris for AFDAS, a theatrical organisation of France, giving a financial help for actor to do a professional workshop (stage de formation). It last 6 weeks, from 10h00-18h00, ( days a week. When the work finish, one participants said to me, " ahh, Tapa, now we are ready to work with you"
It is naturally exist that the work never stop; the question is how to find it, to dis-cover it. It is there. Even when you find it, not sure you want to take it. Sometime your brain said, ahh, "not that now!". So, you see, intelligent can trick your own intelligent. Quoting from Bhagavad Gita, Krishna said to Arjuna that the mind is a good friend but it can be also the worst enemy, depend who you are. The last moment to say farewell in Casa Natura Alpenise in Cima Grappa is everybody handling one's other Tripass, as you see ten of them here the picture, in a sort of "ritual", and that moment i declared to them it is their diploma, in fact it is them who design and create their diploma, day by day, by adding a sign in their Tripass/disquette every day with a colored pen, and the same color used to write their new sacred syllable. 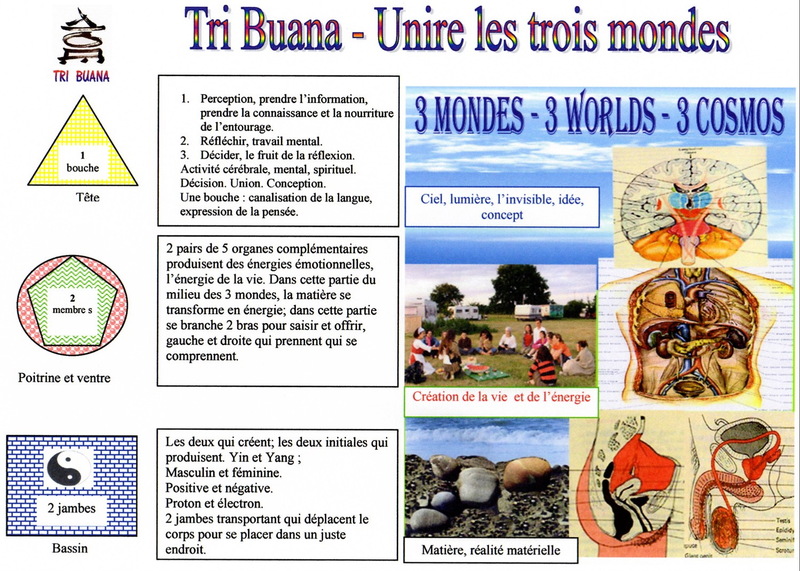 We made also 3 commun/group Tripass/disquette/Bayuswara in 3 form: square, round, triangle: see photos. 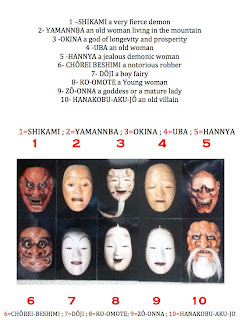 And i did offer them on postcard of picture of Japanese mask as you see here. At the end, the 3 group Tripass was taken by 3 participants, and it can be an indication, a guide, how the 3 forms is put in line, it will determine which form guide.....etc. 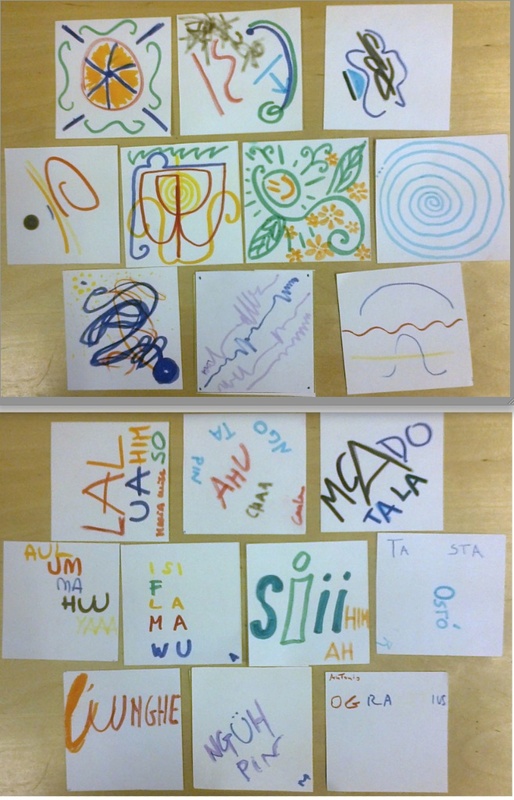 Ahh, for this time of Easter workshop, Tribuana did not make photos of the work and participants, ...why? it has its own natural consideration! 10 japanese masks, offered to each of 10 participant of Easter Tribuana Retreat Cima Grappa Italia 2013. 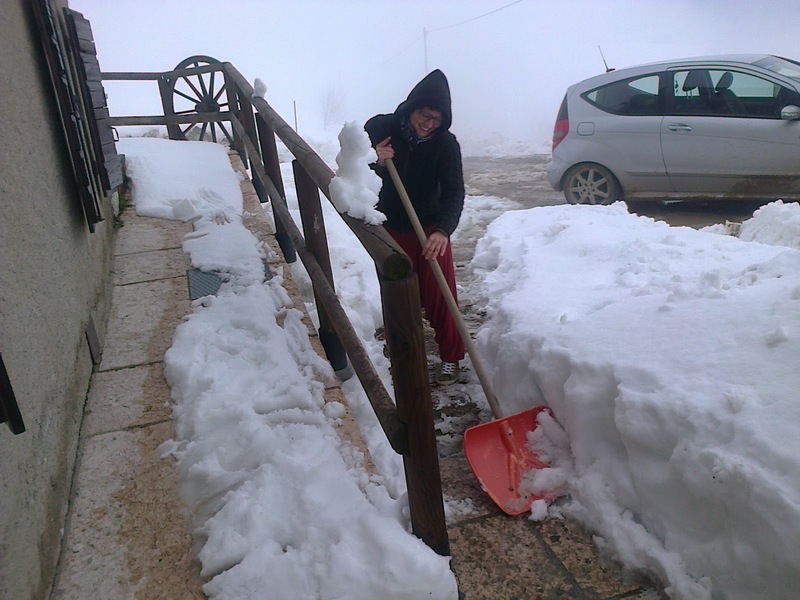 One of our participant can not arrive that night because of the snow, she came the next morning. 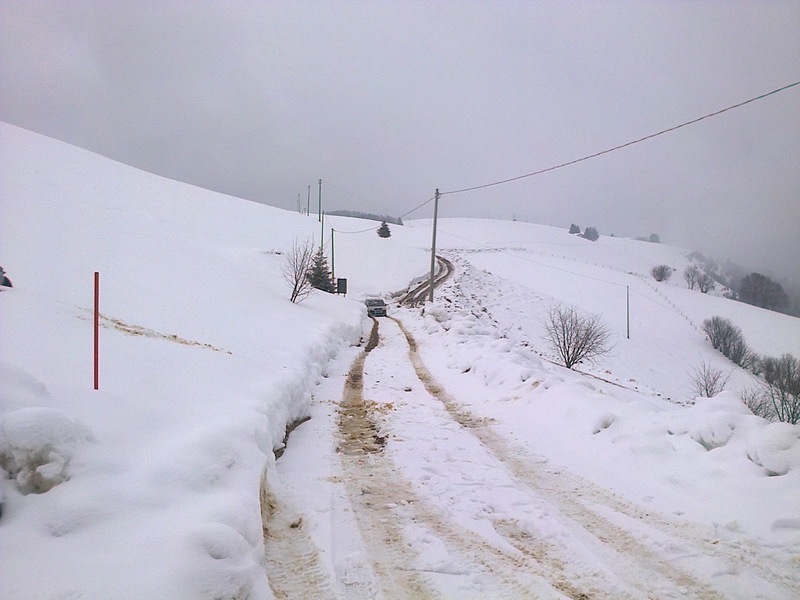 3 participants was stuck in the way because of the car can not pass in that snowy-road, luckily ..
fortunately a generous kind Italian angle name: Nicolo with his 4x4 took 4 ladys participants till Casa Natura Alpenise Cima Grapa that late afternoon. 1.to taste the vocal and consonant of your syllable. to pronounce it with gesture or movement that will become the personal/sacred dance of Tripass. 2.to find the natural order, how to link one syllable with the other. You may also just to pronounce it in the order of their birth. The color can be a memory-help, if you mark it somewhere the arrival of your pen/color to write. 3.When you find the chain of sound in order, then the time to "sing" it as a very-very dearest sound/song, your characteristic sonic personality. 4. Sounding like "mantra" recitation and movement lead to tai-chi tribuana. la responsabilité se partage entre guide/maître et participants. partage= la part de fruit de l'âge. le temps ne diminue jamais, comment habiter le temps? entendre 2 fois de dedans et dehors pour bien parler une fois. We try to honor and enjoy every moment in life, the master can sleep in movements, in thing/object, in time, space, in whatever you do and in your creation. Awaken the sleeping master (in or out of yourself) is one of the tribuana retreat Easter aims. 1:triangle-symbol: understanding/idea,comprehension about the work. 3:square-symbol: real money, Euros, materially manifested exchange elements. is she an angel cleaner the way? the path to Casa Natura Cima Grappa ? that can be met with Bayuswara and Tripass of each participant. voir le monde pour l'avoir intérieurement. O I wonder who got which one???? if we know how to maintain our link. to choose: to be alone or together with others ! yess, well, of course: what is more important to you in your life NOW ! imagine when those 10 spirit in retreat making a journey to Simorgh ... one day. ..